If buying a house with a federally-backed mortgage in a high risk flooding area, or in a flood zone, flood insurance is mandatory. Now if the home is inherited or paid off, it is up to the homeowner if they want flood insurance or not. We recommend everyone getting flood insurance, flooding can even happen in a non-flood zones. 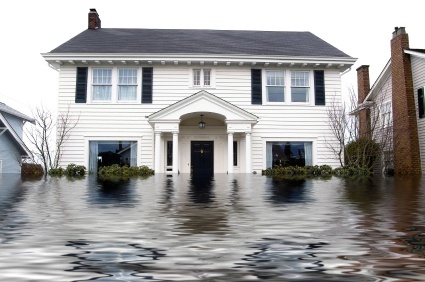 Flood insurance protects from rising waters in areas of the home that are normally dry. It also covers cleanup, debris, mold removal, and repairs to the structure of the house. A homeowner can insure a house for up to $250,000 and the contents inside the house for up to $100,000. 3. What DOESN'T flood insurance cover? Flood insurance doesn’t cover any "Earth Movement" such as landslides, sinkholes, movement of land due to water accumulation, or erosion. Even if it causes flooding. If you buy flood insurance for belongings like artwork, antiques, and jewelry, coverage is typically limited. Flooding can happen in any given moment, it is best to be prepared for a storm by having homeowners insurance as well as flood insurance. When purchasing flood insurance, there is a 30 day waiting period from the date of purchase. So double check your home and flood insurance policies, because when a storm rolls in, you don't want to be stuck in high water. If you would like more information about flood insurance or other questions regarding homeowners insurance, click the button below.